Heelloooo!!!! 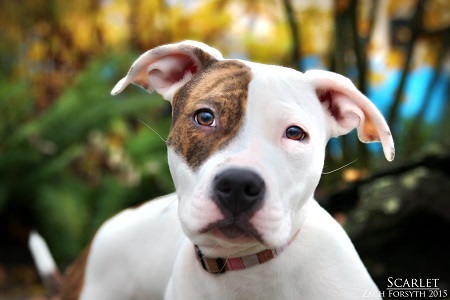 Your wiggly, happy-go-lucky, huggable, lovable neighborhood Pit mix Scarlet here! I’m a 7 month old girl who is ready to find my forever home. My perfect family would be a group of curious, adventure seeking, explorer types that aren’t afraid of getting dirty and are always eager to learn new things! Together we can conquer mountains and puppy classes and end each day with a snuggle session. I am awesome with all people and other dogs. I may be OK with cats as long as there is plenty of management and training at the beginning – after all I am puppy still! Do I sound like just the pup for you? Fill out the adoption application so we can schedule a meet and greet. Due to my breed I need to go to a family that owns their home. I am fixed, vaccinated and microchipped. My adoption fee is $250. I am currently living in foster care.